Just in case you're sick of all the heartwarming holiday spots around at the moment, here's a campaign that provide an antidote. 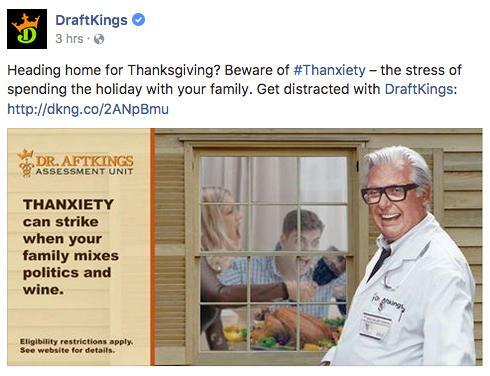 Fantasy sports contest provider DraftKings is basing its holiday social media campaign around the notion of "Thanxiety" -- anxiety about spending Thanksgiving with your relatives. The campaign, via Deutsch New York, involves a "Dr. Aftkings" taking players through the causes and symptoms of this unfortunate condition -- for example, one tweet reads "Thanxiety can strike when your family mixes politics and wine." At the end of each piece of content, he makes his conclusion clear: the only way to get through Thanksgiving unharmed is to play DraftKings. The camapign is running till Nov. 26 across DraftKings' Instagram, Twitter and Facebook channels.